What a day! It began with a quick return trip to the middle and high school, Barye Fe, for some of us to drop off medications and provide instructions for use of some of the medications that we had prescribed on Wednesday. Others in our group went straight on to the clinic to get started as this was our last day and not only did we have to see patients, but we also had to conduct closing activities, cleaning, and inventory. Upon arriving at the school, we quickly found our students and passed along the medications and instructions. The students surprised us by writing a letter expressing their gratitude, appreciation and a desire to pray for us and our work. It was a touching note that was even more special given the earnestness of their message. While we could have lingered longer in the presence of these impressive kids (all smartly dressed in their school uniforms), the reality was that we needed to get to the clinic and see patients. Pulling up to the clinic for what was supposed to be a “slower” day seeing fewer patients – only 60 were scheduled – we were greeted with a much different reality. The porch of our clinic was packed with patients, and there were patients already awaiting us in triage and in the waiting areas. 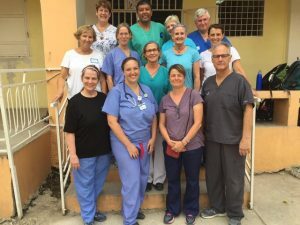 But a situation that had originally seemed overwhelming, quickly gave way to a sense of accomplishment as we realized that many of the patients waiting were return patients! Patients with ailments that necessitated follow-up, that were sent out earlier in the week with a prescription, instructions to return and a prayer that they would…and they did! Many had not only returned, but also improved – some dramatically so! From the child with a forehead abscess that resolved to the child with a chronic infection in his lower leg that had markedly improved, there was evidence of the importance and the necessity of our work. This isn’t to say that we could solve all the problems that we encountered as there were many that were beyond our scope. But, for these patients, we were able to consult our Haitian colleague and arranged] for follow-up and treatment at another time. 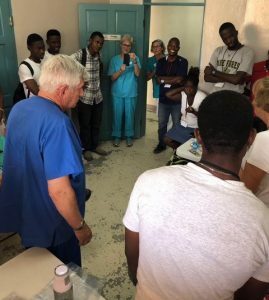 By 2:00pm on Friday, we had seen approximately 500 patients, drained abscesses, provided breathing treatments, prescribed countless prescriptions, and prayed for and with our Haitian friends. I’m always struck by how exhausting yet rewarding the work is, but what strikes me even more deeply is how sad I am that the week is over and that the clinic work is done. I will miss our team – not only the 13 individuals from the states who made the trip, who come together to efficiently see and treat nearly 500 patients in a week, but also our incredible team of Haitian translators (Paulinx, Markens, Eugenie, Wood, Evans, Osmack, Marline, Andy, Calvin, and Joseph), without whom our work could not have happened. We concluded our day as we had all week by debriefing the day’s events, but we also had a special treat in that Pat had invited our Haitian physician colleague, Dr. Quency, to join us for dinner. What a treat! 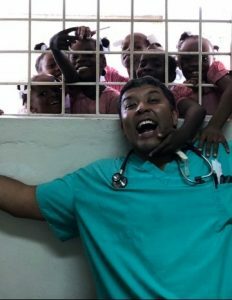 Dr. Quency embodies the humility, class, intelligence, and kindness of the Haitian people. To think that the efforts of our week are his reality week in and week out is a humbling thought. Final team debrief – what a week! Our evening devotion discussed the transfiguration of Jesus Christ and how the high that we all feel right now will slowly wear off over the coming days and weeks and how to re-enter our everyday lives. I wish I had the answer to that because I know, from prior experiences, that the next days and weeks will be tough. It will be hard to “re-acclimatize” myself to my “first-world problems,” knowing that people not so far away are facing much more stressful conditions daily. But I end knowing that despite this, their hearts are filled with joy and they are praying with and for me every day.